Today we celebrate the completion and sale of the third home in the Audrey Street Initiative! Based on the award-winning design by KITE principal Christine M. West, AIA, the Audrey Street homes can be used to meet LEED-Homes criteria for green building, Energy Star Homes Certifications, as well as Rhode Island Housing standards. 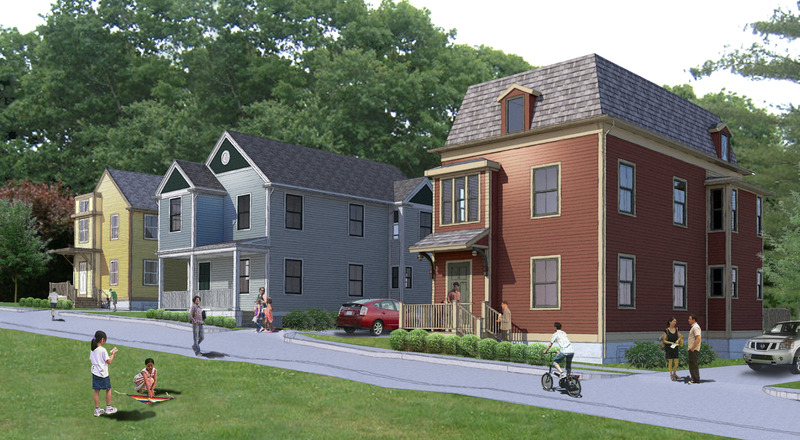 The design for the single-family house is modeled on Victorian homes found throughout Providence, and each version features an entry tower that gives the house a unique identity and encourages vertical air circulation to avoid air conditioning. The compact size and numerous common-sense features such as high-grade insulation help make it both “green” and affordable to build and maintain. The Olneyville Housing Corporation has worked with KITE on an ongoing basis to build their winning design for the Providence Sustainable House Competition on several sites in the Olneyville neighborhood of Providence. Three variations on the basic house design have been developed to allow variety in both appearance and features as multiple homes are built. We at KITE would like to thank to all involved in the development of our environmentally sensible homes and off a great congratulations to the homeowners!